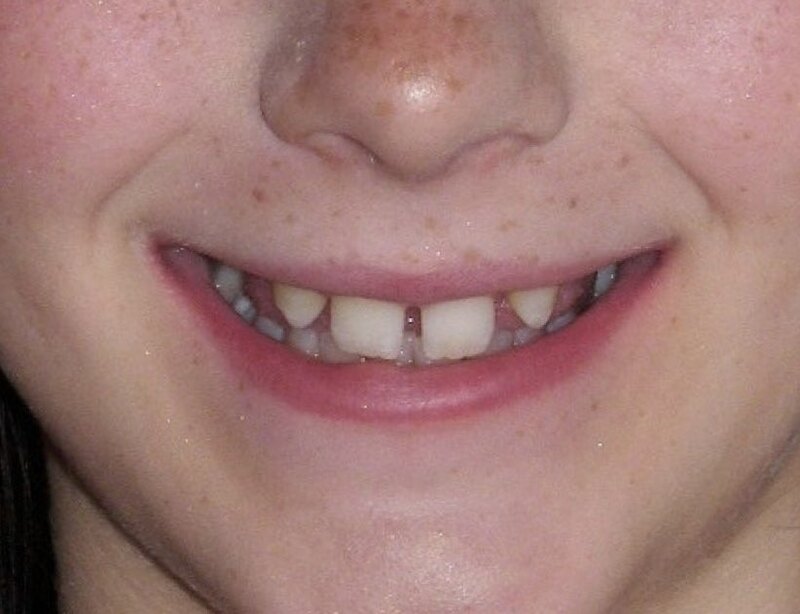 A 19-year-old female patient, with good general and oral health, presented with multiple aplasias, substantial vertical overlap (overbite), and a medium-to-high smile line. Four years ago, she received pre-prosthetic orthodontic treatment to insert resin-bonded fixed partial dentures at positions #12 and #22 FDI (#7 and #10 US). Following further facial growth, she is now ready to replace her partial dentures with implants. Of note, the patient's primary second molars persist without problems. The patient received Nobel Active 3.5 (13 mm) implants and simultaneous bone augmentation with bone substitute (Geistlich Bio-Oss®). 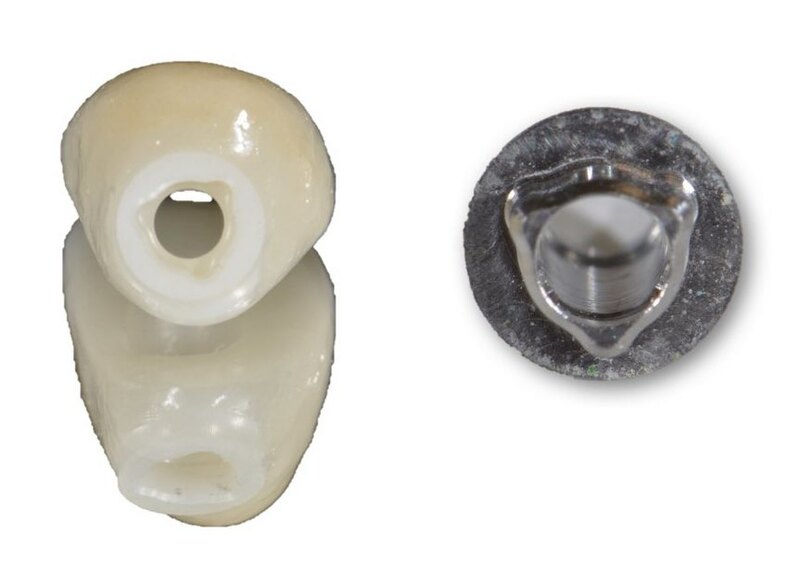 Prosthetic solutions used were the NobelProcera® ASC abutment with FCZ (full contour zirconia) crown with buccal cut-backs and surface porcelain. 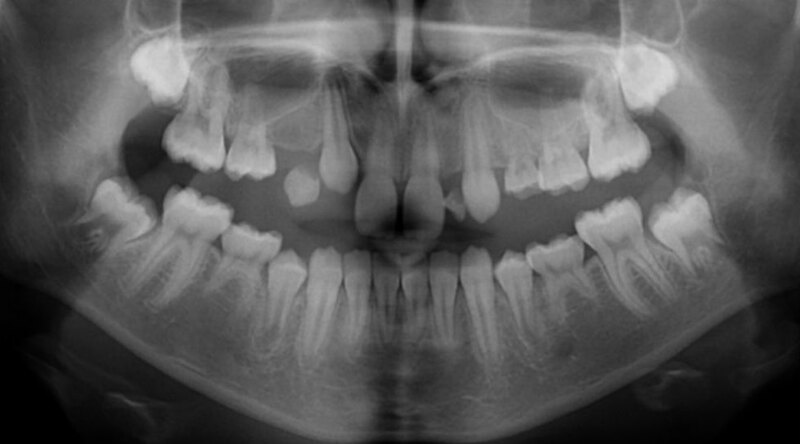 Panoramic radiograph at 10 years of age. Multiple aplasia. Teeth #15, #14, #12, #22, #24, #25, #35, #45 FDI (#4, #5, #7, #10, #12, #13, #20, #29 US) missing. Not all permanent teeth have erupted. Persisting primary teeth #55, #53, #64, #65, #75, #85 FDI (A, C, I, J, K, T US). 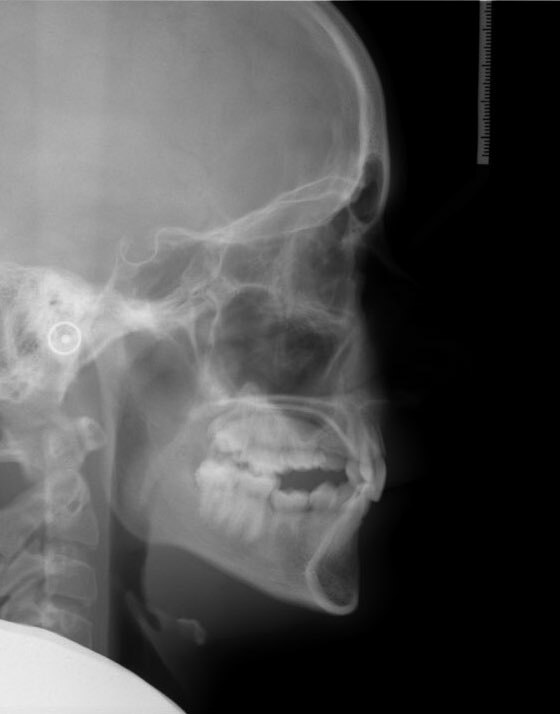 Panoramic radiograph at 13 years of age. All permanent teeth fully erupted. Persisting primary molars #55, #64, #65, #75, #85 FDI (A, I, J, K, T US). Facial analysis, all present permanent teeth fully erupted. Time to start preprosthetic orthodontic treatment. 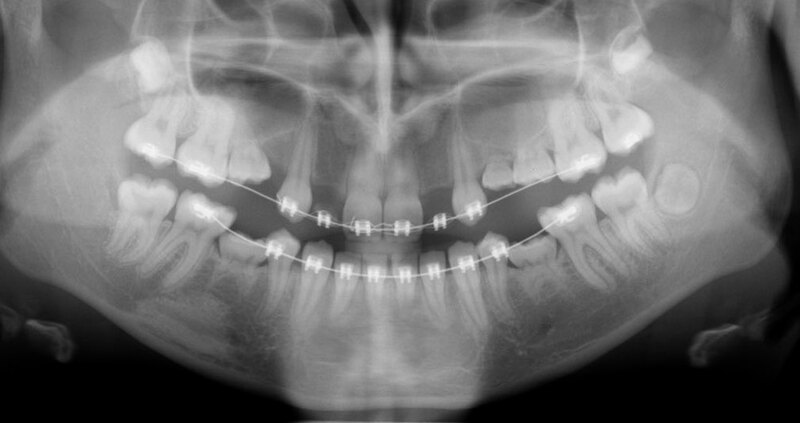 Cephalostatic radiograph prior to orthodontic treatment. Intraoral frontal view. 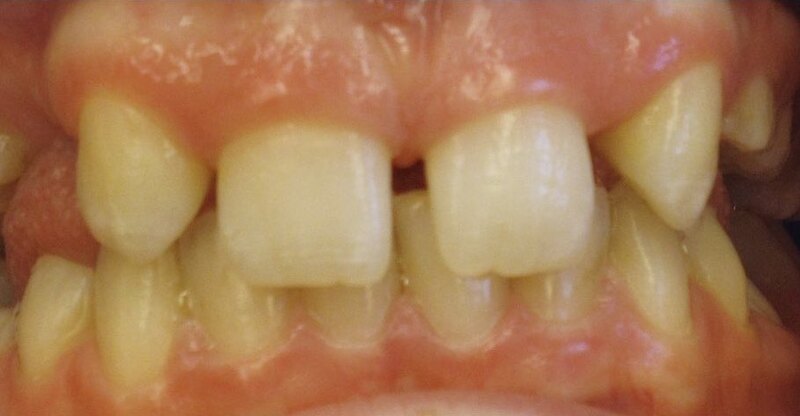 Frontal diastema and substantial vertical overlap (overbite). Space opening to 6-7 mm position #12 and #22 FDI (#7 and #10 US) is planned to make space for implants. Intraoral lateral view. Substantial vertical overlap (overbite), lack of occlusion in premolar areas. 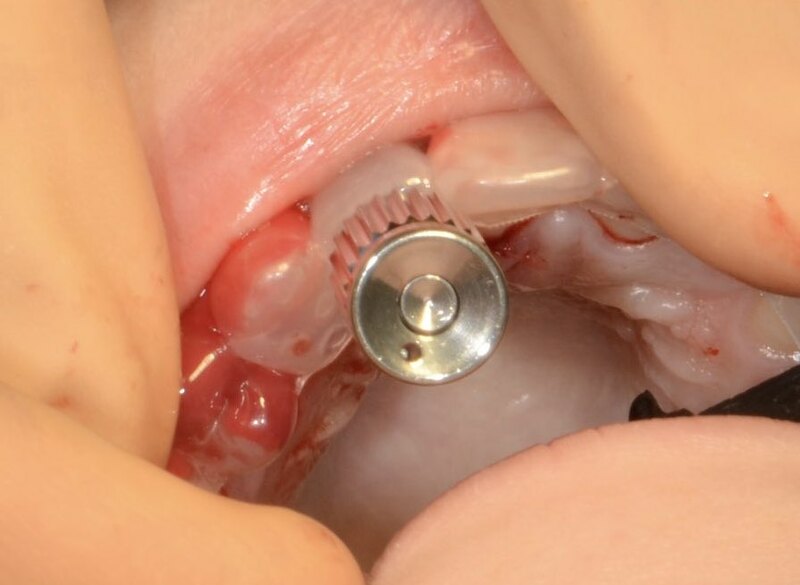 Opening of deep bite planned during orthodontic treatment. Patient 15-years old. 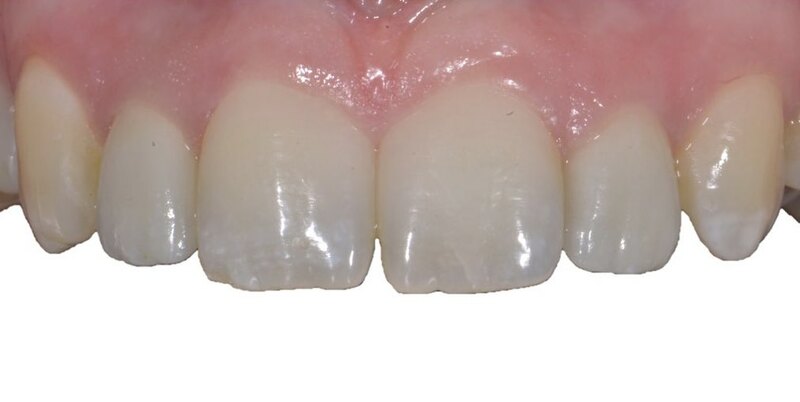 Result of preprosthetic orthodontic space opening position position #12 and #22 FDI (#7 and #10 US) and opening of substantial vertical overlap (overbite), prior to bonding of orthodontic prostheses. Acrylic pontics in position position #12 and #22 FDI (#7 and #10 US). Patient 15-years old. 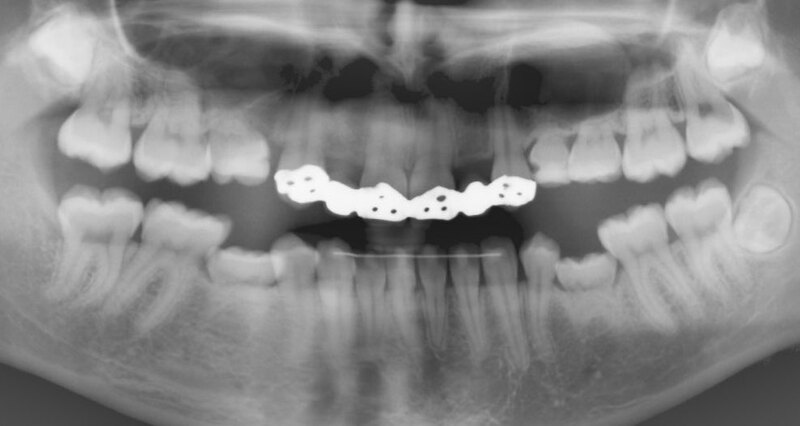 Panoramic radiograph prior to debonding of orthodontic appliances. Assessment of prognosis for persisting primary molars and the risk of them ending up in infraposition which is very small since the patients somatic growth is considered complete. 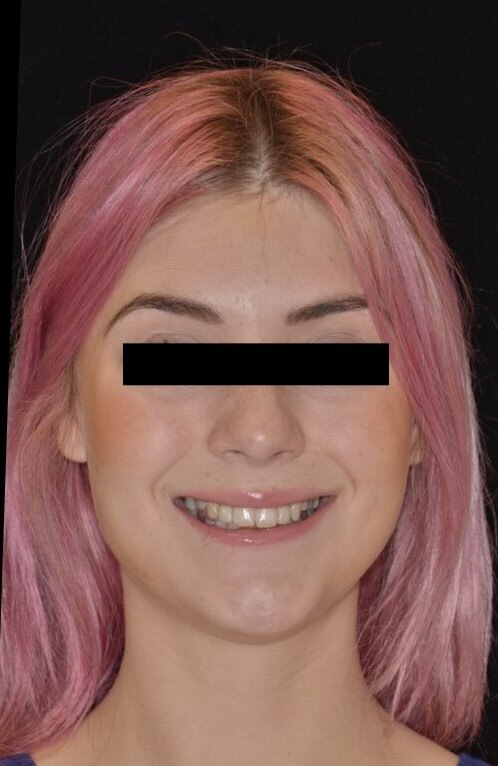 Patient 19-years old, presents a medium - high smile line. At prosthetic treatment planning space between teeth and amount of bone to place lateral incisors implants are clinically assessed. 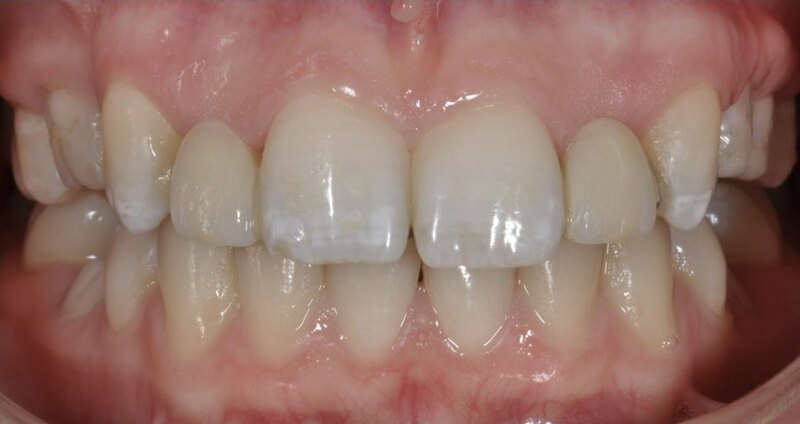 The patient is only interested in replacing the lateral incisors with implants. Facial analysis. Extraoral profile picture showing slightly pronounced mentolabial sulcus. Extraoral sign of a substantial vertical overlap (overbite). 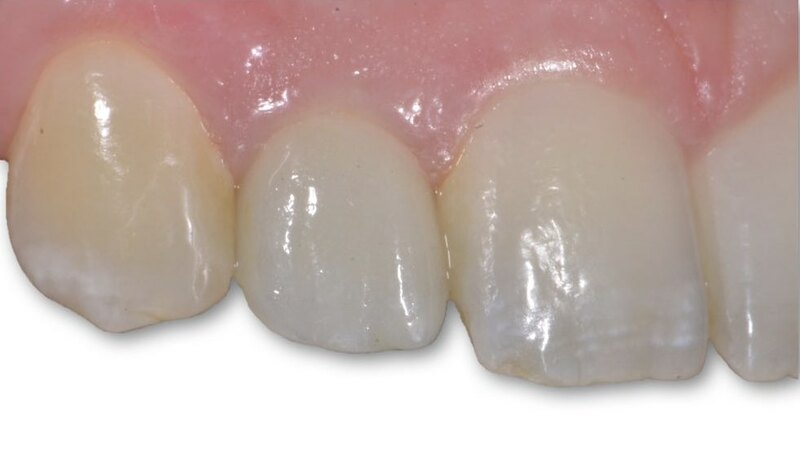 Frontal view of the resin-bonded fixed partial denture used as a provisional solution from 15-19 years age. 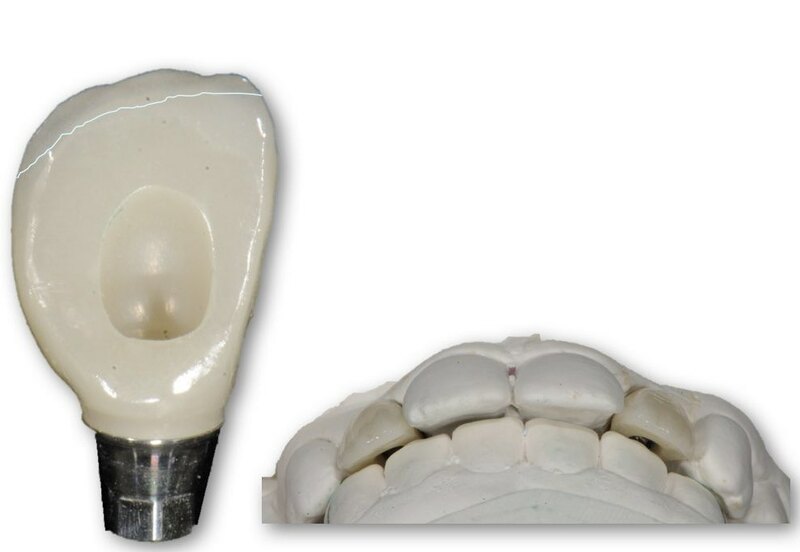 Occlusal view of the resin-bonded fixed partial denture used as a provisional solution from 15-19 years age. 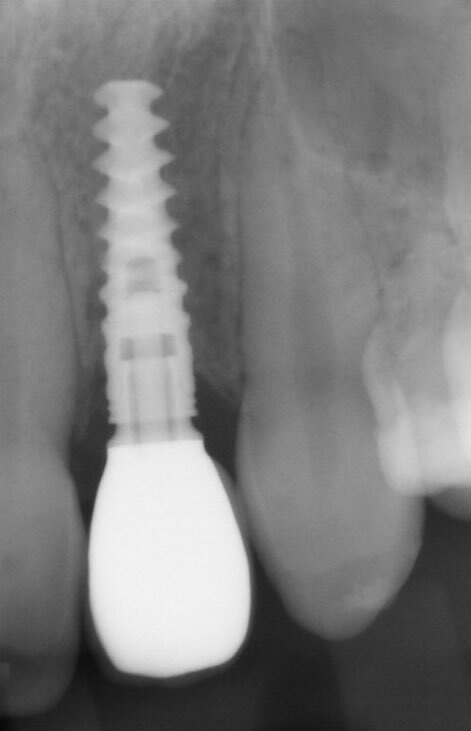 Panoramic radiograph for planning of implant treatment. 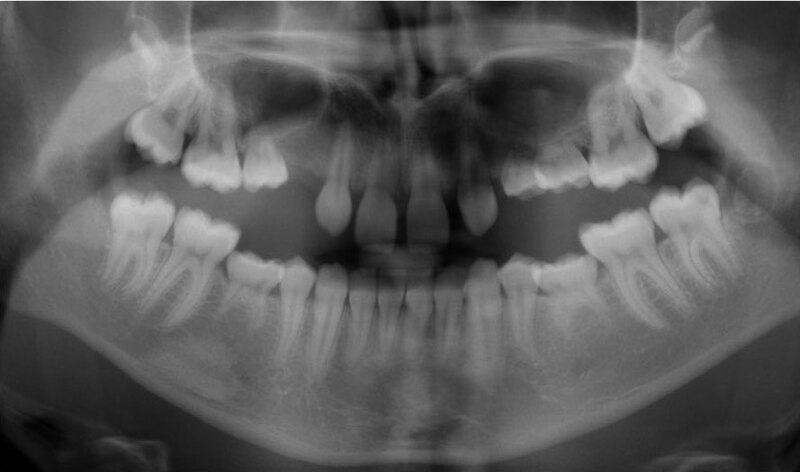 New radiologic assessment of primary molars. Prognosis still adequate. 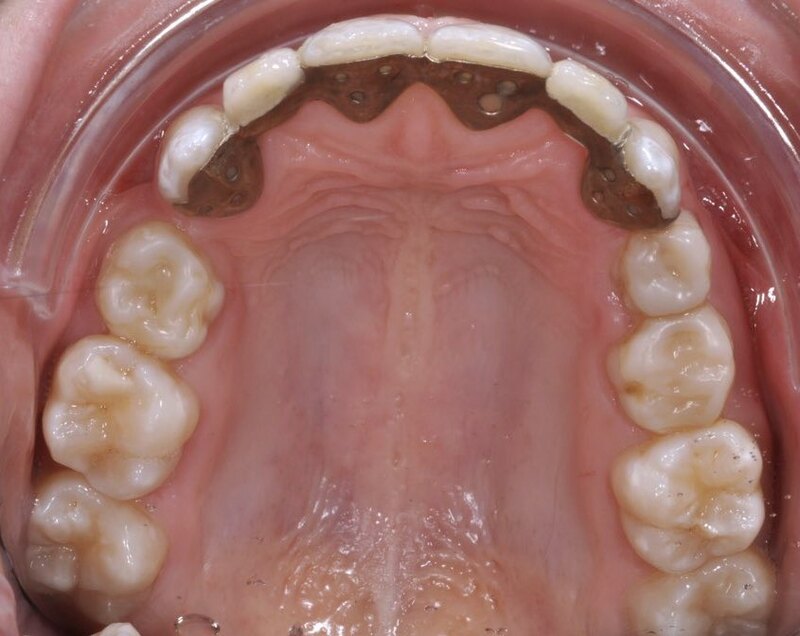 Assessment of risk of primary molars ending up in further infra position. Looks adequate. Intraoral radiograph to measure mesio-distal space. Parallel to diverging roots shows good apical space for implant placement. CBCT examination. Transversal view to measure mesio-distal space for implants position #12 and #22 FDI (#7 and #10 US). CBCT examination of right lateral incisor. 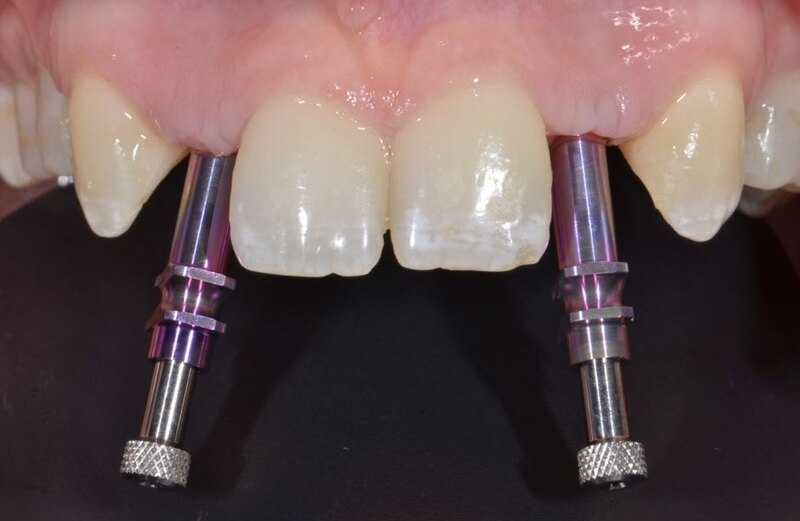 Buccal bone contour shows possible need for bone augmentation at implant placement. CBCT examination of left lateral incisor. 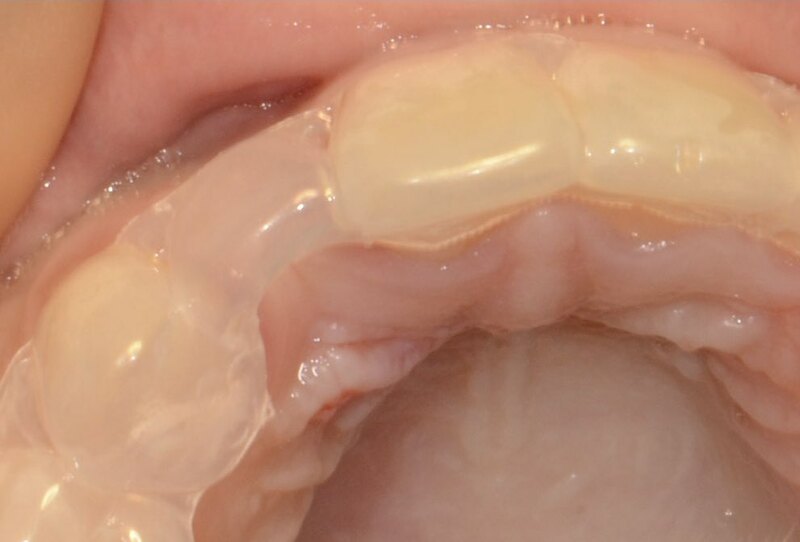 Buccal bone contour shows possible need for bone augmentation at implant placement. Manually produced acrylic guide to communicate the wish of position and angulation of implants to the surgeon. Important that the dental technichian is involved in making the guide. Intraoral view trying the surgical guide prior to surgery. Try-in guide pin according to guide during surgery. 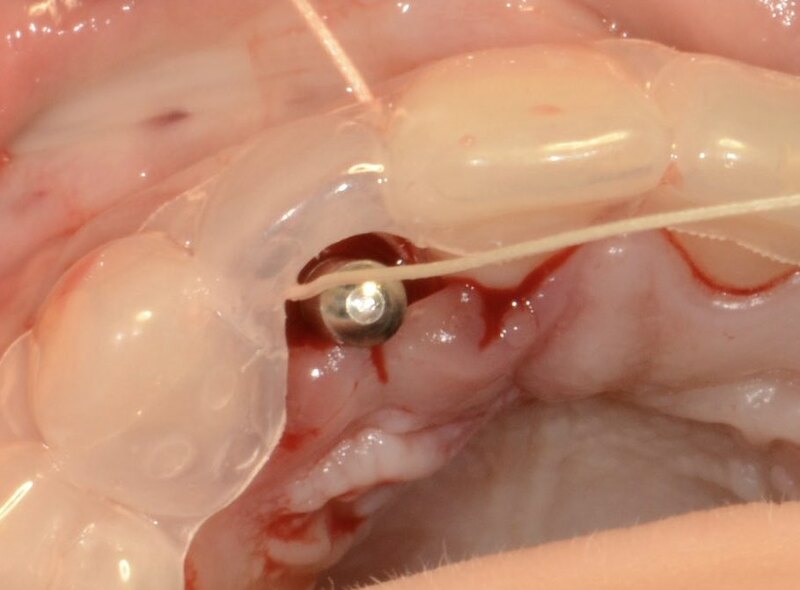 Intraoral view checking position and angulation after placing the implant. 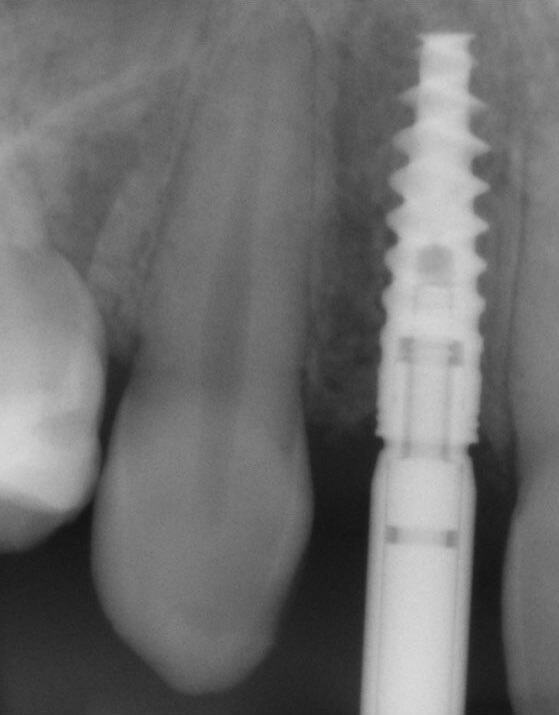 Intraoral radiograph of implant position #22 FDI (#10 US) Nobel Active NP (13mm) implants with healing abutment in place. Shallow placement of implant. 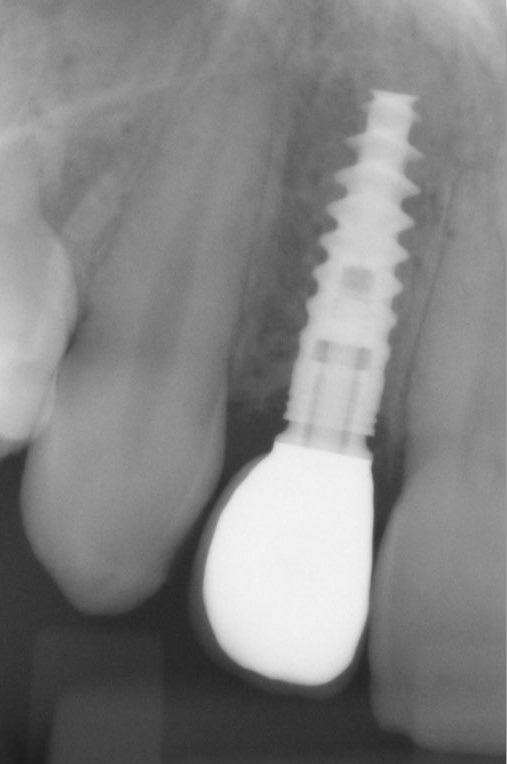 Intraoral radiograph of implant position #12 FDI (#7 US) of Nobel Active NP (13mm) implant with impression coping in place. Shallow placement of implant. 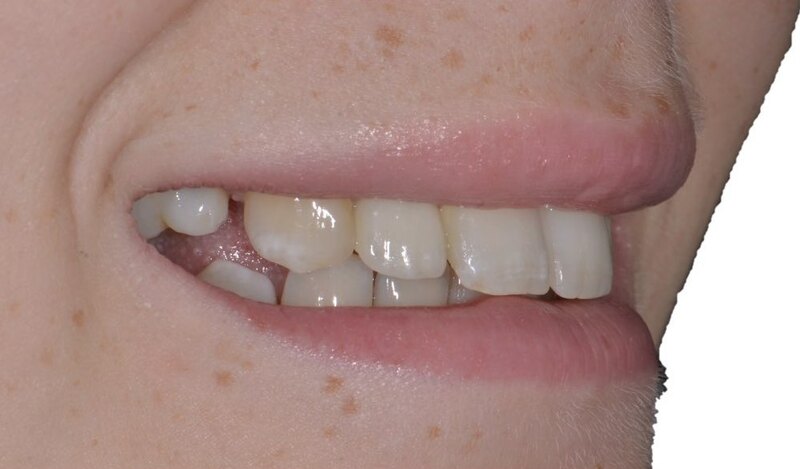 Impression taking 2 months after implant placement. 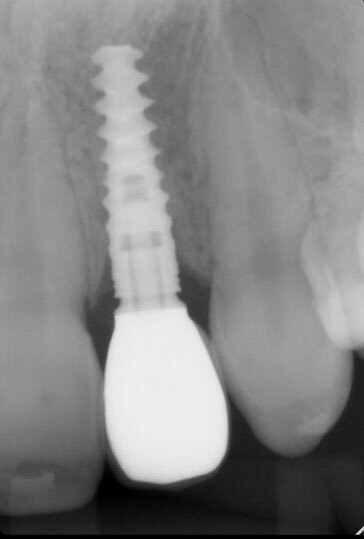 Picture shows placement and inclination of the implant. 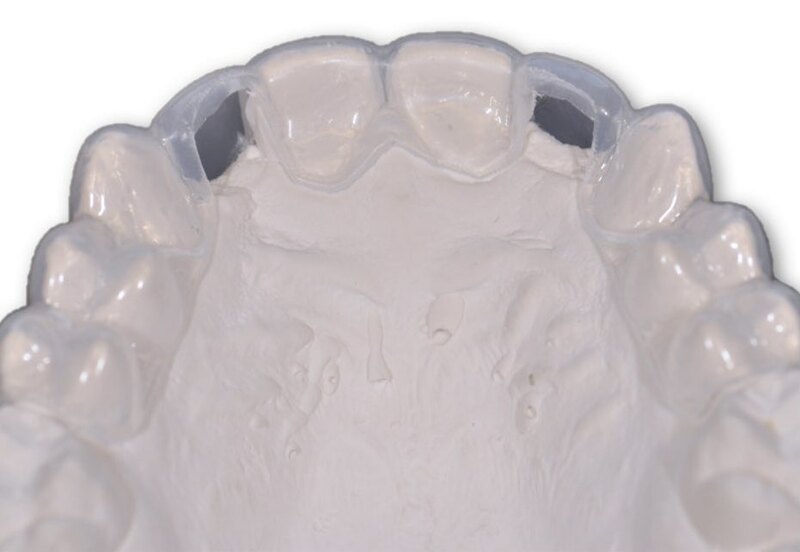 Occlusal view of impression copings. 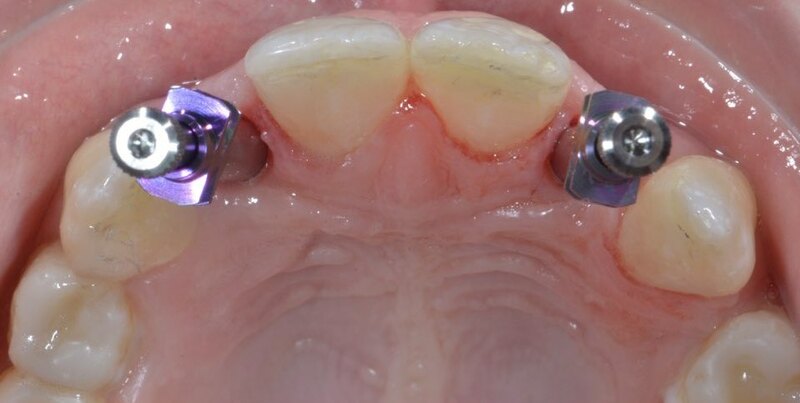 Shows position and tilting of implants in bucco-palatal direction. 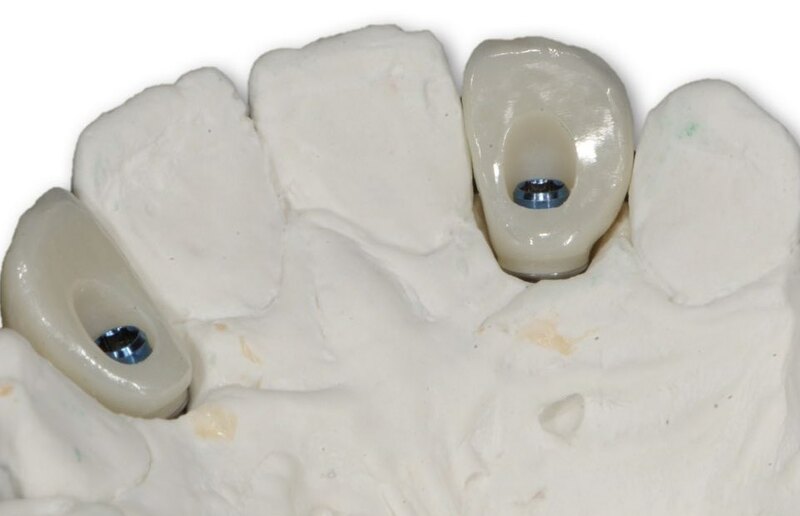 Nobel Procera ®ASC abutment, Nobel Procera ®FCZ, emergence profile depends on the shallow placement of the implants. 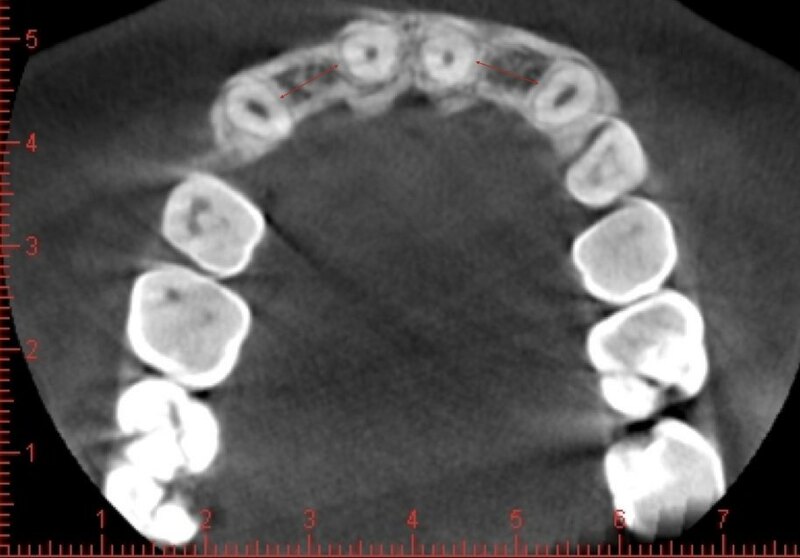 Substantial vertical overlap (overbite) and shallow placement of the implant. Restricted space for prosthetic construction. Almost full zircona palatally. 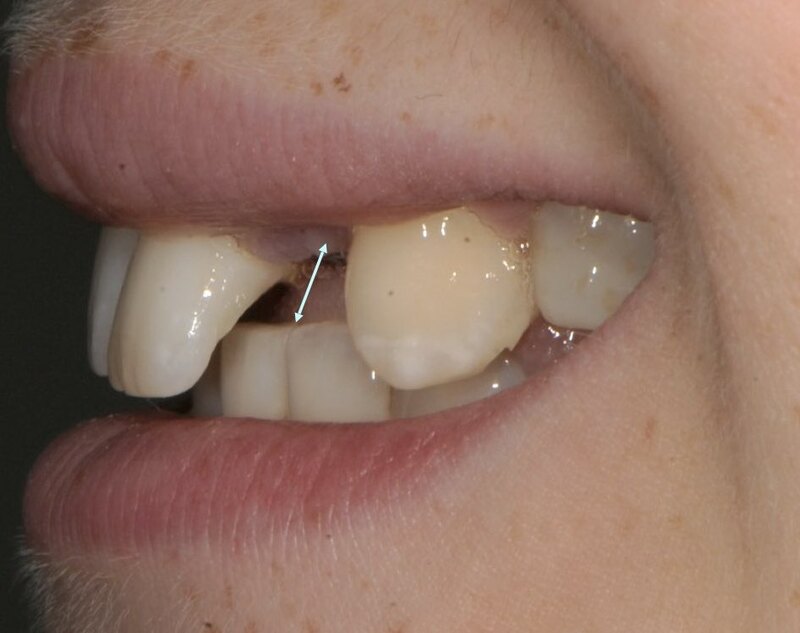 Even though preprosthetic orthodontics has been performed, substantial vertical overlap (overbite) and restricted space for prosthetic construction is present. Intraoral radiograph of implants position #12 FDI (#7 US) with definitive crown in place. Due to the thin marginal bone crest we can already see signs of bone remodelling. 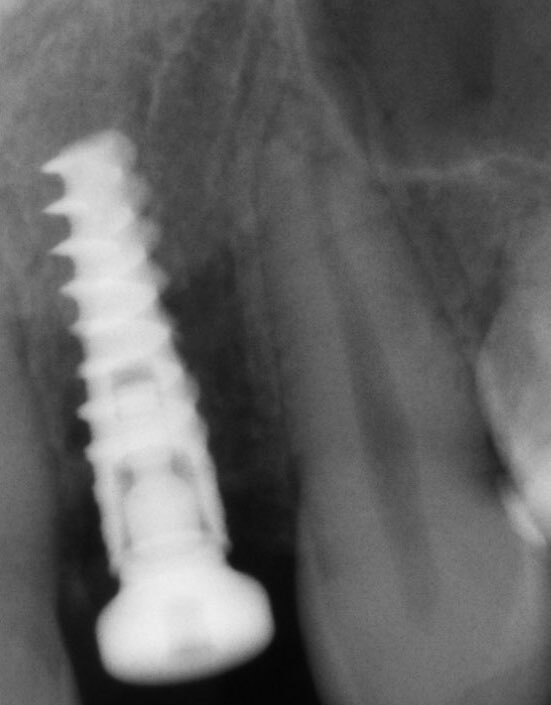 Intraoral radiograph of implants position #22 FDI (#10 US) with definitive crown in place. Due to the thin marginal bone crest we can already see signs of bone remodelling. Palatal view of crowns in place. 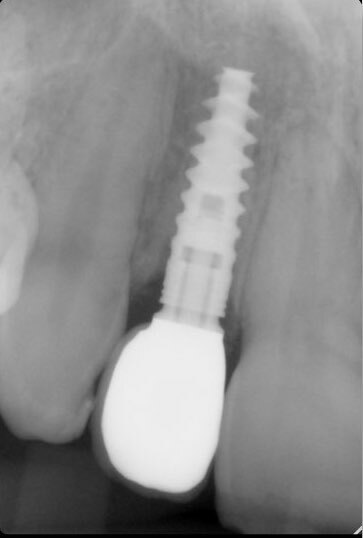 Due to shallow implant placement implant screws are hard to hide. Intraoral view, lateral incisor crowns at delivery. 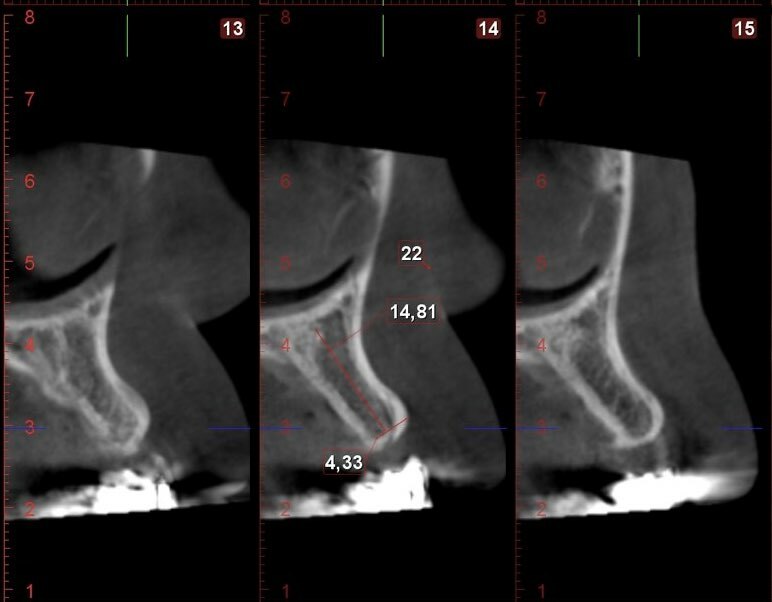 Intraoral radiograph at 12 months follow-up of #12 FDI (#7 US). Marginal bone remodelling. 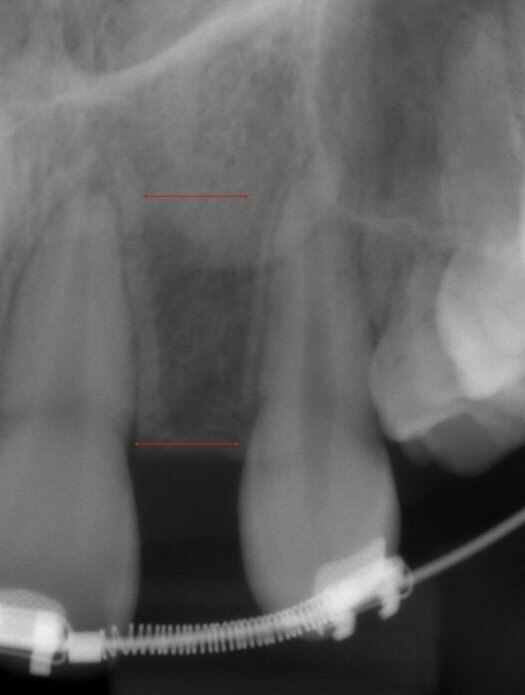 Intraoral radiograph at 12 months follow-up of #22 FDI (#10 US). Marginal bone remodelling. Intraoral view, 12 months follow-up. 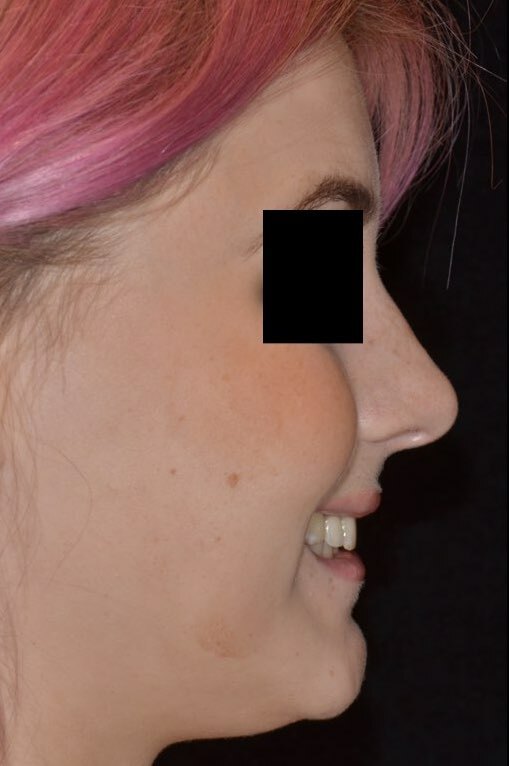 Lateral view, 12 months follow-up. 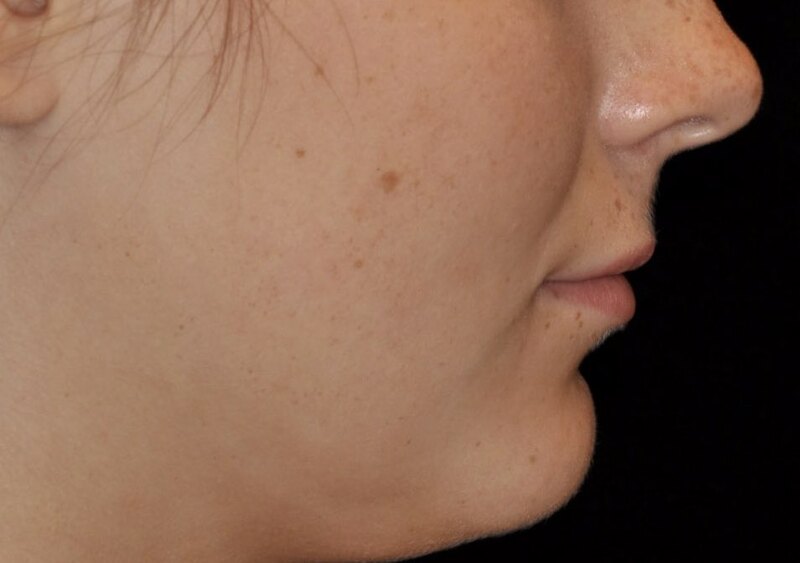 Smile line, 12 months follow-up lateral view. Facial view 12 months follow-up. 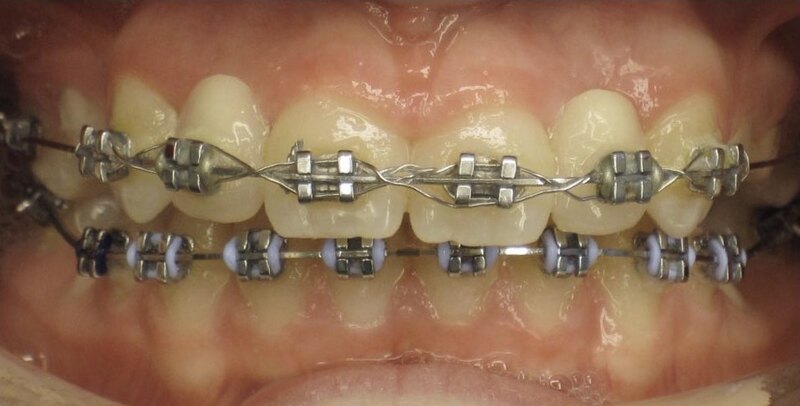 Orthodontic Space Closure for Management of Congenitally Missing Upper Lateral Incisors. 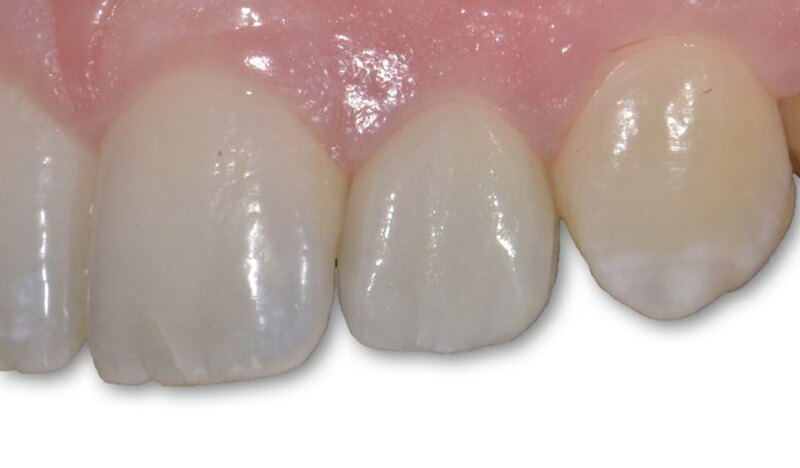 Congenitally missing maxillary lateral incisors: Restorative replacement. 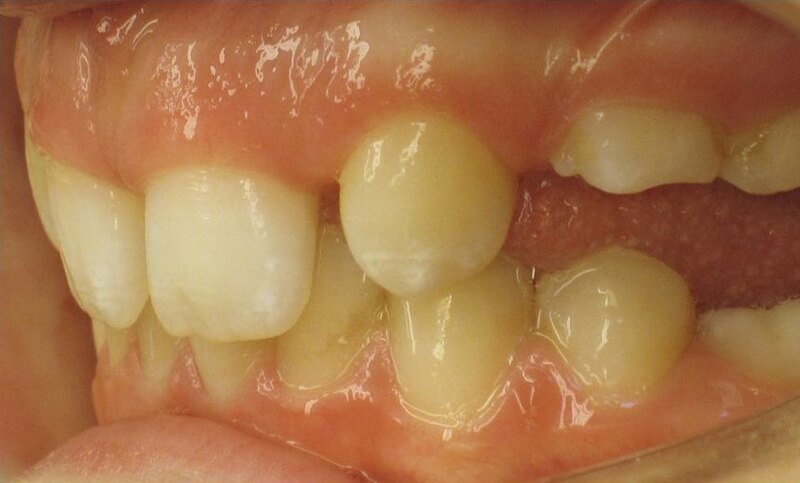 Agenesis of maxillary lateral incisors: A global overview of the clinical problem. Principles of cosmetic dentistry in orthodontics: Part 1. Shape and proportionality of anterior teeth.